Part One's contributors were Tricia Hyun, Sarah Thomas, John B. King, Jr., Mandi White and Tara Dale. You can listen to a 10-minute conversation I had with Tricia and Sarah on my BAM! Radio Show. You can also find a list of, and links to, previous shows here. Today's responses come from Donna Wilson, Marcus Conyers, Rachael George, Meghan Everette, and Carolina Pérez. Today we stand at a unique moment in the history of education. As the field of learning sciences gains momentum, it is an incredibly exciting time to be an educator. This new field now points the way to develop more effective learning environments and instructional processes, including, for example, the explicit teaching of practical metacognitive, cognitive, and social skills to enhance the academic achievement of all students in the 21st century. Advances in our understanding of how learning occurs can and should inform the development of evidence-based education policy and instructional practices that can help all students reach more of their academic potential. Understandings about the amazing plasticity of the brain and dynamic and multifaceted intelligence provide a more scientific basis in support of higher expectations for all students, including low-income and minority youth. The development of brain-imaging technologies over the past few decades has enhanced understanding that the brain can change and adapt over the course of life. The field of neuroscience now shows that the brain is malleable, makes new cellular connections, and changes in structure and function as learning transpires across the life span. This understanding is a dramatic departure from 20th century beliefs that the brain was largely finished growing by the teenage years. This new view has dramatic implications for the professional learning of administrators, policymakers, teachers, and other educational stakeholders in our communities. Fortified with this scientific foundation, educational leaders today have even greater backing to support teachers with practical opportunities to learn new knowledge and strategies and time to purposefully collaborate with their colleagues to create and test lessons and consistently enhance their skills. Through opportunities such as these, more teachers can find greater hope and satisfaction in their work as they empower students with the skills and knowledge they need to achieve at higher levels of success, both academically and in life outside of school. By applying inspiring and practical understandings from the learning sciences, we are now poised to create schools where powerful learning experiences occur for every educational stakeholder who enters the schoolhouse doors! I believe the most exciting things going on in education today is the kids. In fact, the most exciting part of the day for me, when it comes to elementary land, is the arrival of students. When kids arrive they are so happy to be at school and excited to see you. You literally can feel the excitement as the kids are dropped off and run into the building, even though they shouldn't be running but instead walking on the sidewalk. For students, arriving at school in the morning represents a fresh start to the day and many positive interactions with both staff and students. For the adults that are lucky enough to greet them at the front of the school doors, we think we have the best job in town. The hugs and excitement you can see in their eyes is unmatched and melts the heart. So regardless of the crazy stuff going on around us, the kids are what we are here for and they are the focus of our attention. That is something to celebrate! Education is in constant flux. My mother, an educator of 40 years, says there isn't anything new in education but just that we come back around to it. And while that may be true, for certainly the pendulum swings every few years, there are three things that have me paying attention and pumped in education today. First, teacher preparation programs have been a buzz lately. Eventually the higher education act will come into play and will bring even greater light to the topic. After working on research around teacher preparation programs for the last two years with Hope Street Group, I have a vested interest in what is happening to our potential teachers. There is a nationwide movement, grown by organizations such as Educators Rising, that are promoting the profession and drawing students into higher education programs. Groups like CCEDAR are working to raise the standards required to be in and complete education programs. Recent research from powerhouses like Linda Darling Hammond highlight that the success of other countries comes from their teacher education system. And while the words "teacher shortage" are common, there is hope. We are raising standards for future educators and the discussion about how best to continue to draw in, teach, and support teachers is thrilling. Second, alternative pathways to leadership continue to spark conversation. Teacher leader is a common phrase, as it should be, but more and more organizations are defining what that means. Even more schools are promoting models that allow teachers to lead without leaving. Organizations, too many to name, promote teachers in the classroom as viable and competent leaders in a variety of different settings both in and outside of the school building. I have never been interested in being an administrator, and yet an administration degree and positions are nearly required for many other leadership roles. And why? Are you saying my ability to manage a classroom or coach a cadre of teachers doesn't transfer in skill? Surely even more can be done to promote these hybrid roles, but the exciting thing is there are now models out there of teachers turned leaders still able to connect with students and schools and yet given a chance to spread their wings. 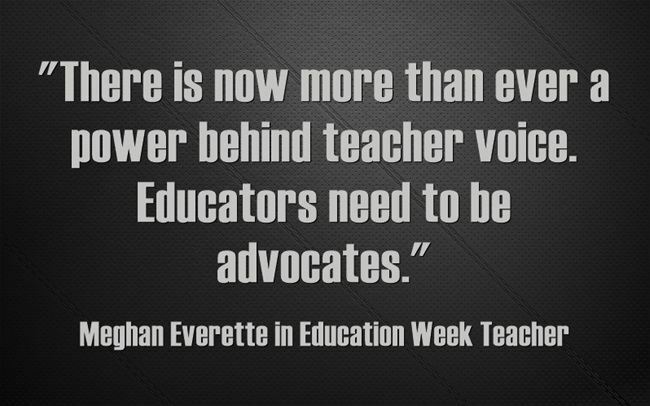 Finally, there is now more than ever a power behind teacher voice. Educators need to be advocates. I spent a year with my Teach to Lead team researching how educators find and use their voice, and what we can do to continue bringing more educators into the fold. In 2014, 4.2 million of the ½ billion daily tweets were from educators, according to EdSurge. Why? Because social media platforms toss titles and administrative degrees aside and allow real conversation about topics important to educators. That voice doesn't go unnoticed, and yet it is just a small piece of the pie. Groups like the Gate's Foundation ECET2 amplify opportunities for educator voice to be head. Teach to Lead provides opportunity for teachers to develop and promote solutions, driving connections with shareholders. ASCD provides opportunities for teachers to meet with policy makers, and even EdCamps have educator-led learning. The discussion is happening and more and more teachers are at the table. There is ample room to amplify educator voice in local and national policy, and that is something we should seize at every opportunity. It's been a rocky year in education. Funding is the regular punching bag and murmurs of getting rid of the Department of Education all together are rife at the national level. Local systems strain under teacher and funding shortages with an ever-growing list of student needs to attend to. And yet, I believe truly that education is power and we have much to be excited and work for. The first time I read this question, I thought, "OMG! How am I going to explain it?" However, I only needed two minutes to put my ideas in order, and to understand that this question was key to comprehending Education nowadays. It is said that we live in a changing world with an unknown future. Nevertheless, I believe that what is totally true is this present moment that we are living. For that reason, I only worry about walking the Life way with firm steps. And like many teachers, two of my main goals (or firm steps), are to help my students to feel confident and to help them progress in our world. If we want to teach, we need to learn constantly. So even while living in the present moment, it is imperative to keep up to date with our constantly changing world. For that reason, many teachers face this everyday challenge by applying new methodologies such as PBL, Visual Thinking, Interactive Learning, the Flipped Classroom, etc., in class. The implementation of these kinds of new methodologies and digital tools are leading to a deep change in Education. 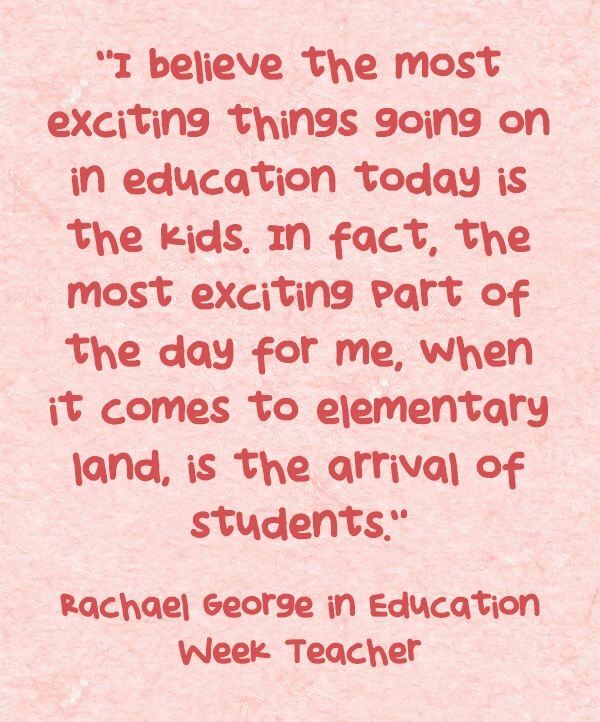 However, I don't think that this is the correct answer to the first question: "What do you think are the most exciting things happening in Education today?" As far as I am concerned, Education is based on the Human Factor, and this is sometimes forgotten. I love this quote from Umberto Eco: "What makes a lesson good is not the teaching of dates and pieces of information, but rather that there is a constant dialogue, a confrontation of opinions, a discussion about what you can learn at school and what happens outside of school." We can teach as Umberto Eco says only if we have a good relationship with our students. And if we work in an environment full of respect and empathy. Because Education is based on the Human Factor. 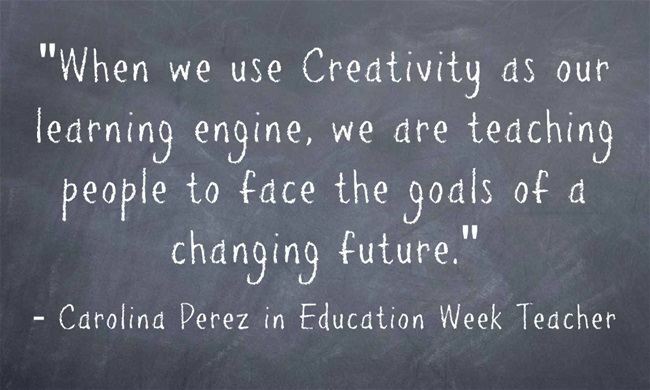 When we use Creativity as our learning engine, we are teaching people to face the goals of a changing future. Creativity is the element of the Human Factor that can always help us face and adapt to change. So we should allow our students to discover a world full of possibilities. To exercise their creativity, respect, and empathy. To engage the Human Factor in their learning. As César Bona says, "Open your doors and share your work, because this is the way to create a new education together." This is what I believe it means to be part of this global world. These are some of the most exciting things happening in Education today. Thanks to Donna, Marcus, Rachael, Meghan and Carolina for their contributions!